Disclaimer: I received a free 3-day pass to E3 from Nintendo, but my opinions written here are still my own. There's no reason to beat around the bush (they don't drop rupees or hearts any more anyway) - Zelda: Breath of the Wild was easily my favorite game that I played at E3 this year. It's a bit hard to write about it because so much more was already shown off during the Nintendo Treehouse stream. Even with the generous 25 minutes of gameplay split between two demos that I got to play, there was so much that I didn't see and which already has been revealed to the internet by Nintendo and others who have played the demos. But, nonetheless, here are my impressions and perhaps there will be something new for you. So, for a bit of context, while waiting for the doors to open to the E3 show floor, I was able to catch the new trailer for Zelda as it was streamed, and just a bit of additional gameplay from between the obscuring heads of the crowd. I've actually avoided watching further gameplay and coverage to keep spoilers for myself to a minimum - probably not the best move for a blogger, but I'm sure some readers would also prefer to be mostly unspoiled as well. After a long, but worthwhile wait, full of things you couldn't possibly want to hear about (meeting Charles Martinet, interviewing the translator of Zero Time Dilemma, etc. ), I entered Nintendo's E3 area, checked out the upcoming amiibo, and was seated in a small room that was decked out to look like a dungeon from Breath of the Wild (shown above). There, we were introduced to the game with a brief gameplay trailer which showed many of the things that could be done in the game. We may have just been giddy about finally getting to play, but the trailer elicited a laugh from the audience on more than one occasion when Link did silly things; most memorably his soup gobbling and under-equipped shivering animations which I can only describe as adorable. The gameplay trailer ended with an animation of the wall rising up like an ancient, magical, dungeon doorway to reveal that the wall it was projected on had actually risen in real life as well, allowing us a path into the large and impressively decorated demo area. Clearly, since this was my top pick, I thought it was extremely fun to say the least. The biggest reason for that was the huge variety of different gameplay mechanics and options available in combat and exploration. You've more than likely already seen what I saw in the trailer and streamed gameplay, but I had a blast with simply defeating enemies with each new kind of weapon I discovered: a sword, a stick, a spear, an axe, bombs of multiple kinds, the bow, and my proudest discovery, a fire rod. The fighting controls were gloriously responsive and smooth (the speed at which you can swap equipment also comes to mind as a highlight), and I quickly felt right at home with the combination of gameplay from classic 3D Zelda games (side hops, targeting, backflips, etc.) and the new additions in Breath of the Wild. 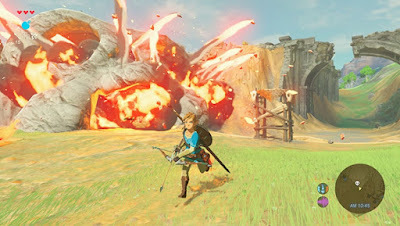 I particularly enjoyed setting fires and watching it spread with the wind, as well as making apparently difficult head shots with the bow with relative ease thanks to the GamePad's motion controls. And then there are the environmental kills from pushing boulders or cutting down trees. For exploration you have gliding, using trees to make bridges, swimming, tons of different items to collect (though I wonder if some might be the sort of thing you come to ignore quickly), equipment that helps with particular environments, lots of cooking recipes, and, of course, climbing on everything. (I didn't actually try all of those things during my demo, by the way.) I can't wait to see all the new options even beyond those that will become available with the new items that are surely hidden later in the game. Although the weapons degrade and eventually break, their variety in stats and type gave me the idea that challenge runs would be fun in this game (i.e. beat the game only with sticks, spears, etc.). I also found that sitting at a campfire could be used to change the time of day in-game, so I wouldn't be surprised if different things became available at different times. I found a fire rod! One of my biggest fears for the game when hearing rumors of it being more open world was that it would be an empty world with little to do, but my concerns were quickly alleviated. There are plenty of items to find, things to fight, and places to discover that are worth the journey just for the view alone (although they do tend to hide treasures as well). The area available in the demo is only a small part of the game's world. And, ah, what views there are. I've enjoyed games primarily for their artistic, eye-pleasing scenery on many occasions (for example, in Journey, Xenoblade Chronicles, Abzu, and Shadow of the Colossus) and been equally bored by worlds of muddy-colored, "normal" designs. Certainly, one's enjoyment of art will largely come down to personal taste, but I could tell that, personally, Breath of the Wild's art direction would be right up my alley. It's bright and colorful, enormous in scale, lonely (but peaceful) in mood, and filled with fantastic terrain and structures. There are story-related goals in the game, as I was shown in my second demo, but even if there were no goals at all, I would be fully entertained in simply exploring and taking screenshots of the beautiful world, as if inside an interactive painting. And, as I said before, the animations are equally stylish and often add bits of humor to the adventure. The visual art can't be talked about without also mentioning the audio... except, I honestly didn't notice the audio enough to say much about it. From what I recall, mellow mood-setting music faded in and out while exploring, which is certainly a change from the Zelda series' usual melodic earworms, but it did succeed in setting the mood and not being annoying with repetitiveness. I discovered a familiar statue from Skyward Sword. Also in this area, I found a bow with no arrows, while the person next to me found arrows with no bow somewhere else. As for the story, I can't claim to know a whole lot. Link wakes up in the mysterious Shrine of Resurrection, which seems to have magical technology that's more futuristic (or ancient) than usual. As Link, the player quickly makes their way out with the occasional guidance from a GamePad-like item, the Sheikah Slate. If the final game is like the demo, this opening tutorial is quite short and upon exiting the shrine, you'll have immediate freedom to explore or pursue the next plot points by talking to a nearby old man and traveling to a distant location marked on the map. For the extra impatient, the cutscenes were even skippable. Since I figured everyone would be following the story on the "story demo", I just continued playing around and going in other directions for the entire time I played. It's great to feel in control of your own gameplay choices for once, rather than being pushed through a series of story hoops before finally being allowed to explore. Finally, since I am a critic, I have to criticize just a little bit. Actually, since the game isn't out yet, this is the best time to make suggestions, when there's still time for things to change. (Being able to make suggestions to developers and demo attendants who seemed to actually care and take note, was one of the coolest things about playing games at E3, though I rarely had any complaints to make - usually just questions.) With Zelda, there were really only two small issues that I noticed: the frame rate and the movement controls in certain situations. Frame rate complaints are pretty self-explanatory; Breath of the Wild did not run at a steady frame rate, which did unfortunately detract from its visual appeal a bit. Considering how long it's been in development, I doubt this is something that can or will be fixed before launch, but I wouldn't doubt that a steadier frame rate will be one benefit of the NX version over the Wii U version. Most casual players don't even seem to notice frame rates though, so I suppose this isn't a huge deal for most. The somewhat bigger deal is that the demo did not have re-mappable controls, something which should be standard in every game. I said earlier that the controls for combat and equipment switching were fluid and fantastic, and this is true, however general movement controls leave something to be desired as a side effect of having so many actions mapped to so many buttons. Here's the problem: you can't run and jump (and move the camera) simultaneously without awkwardly putting a second finger up on the face buttons to press two at once. In most cases, you won't need to do this, but there will be times that you will, and it would be incredibly helpful for there to be an option to remap buttons to one's personal preference. This was just a demo though, so it's entirely possible that these kind of control options are already in the full game (the attendant I asked didn't know, but said that I wasn't the first to ask). All things considered, my gripes about the frame rate and control options are minor compared to how fun and beautiful this new Zelda seems overall. Whether or not you will enjoy this return to the series' open world roots will be up to personal taste, but it certainly has me excited. I rarely get hyped over new games these days when I already have so many great old games to play, but Breath of the Wild is a rare exception that has me genuinely excited to try more as soon as I can. There's so much to explore and so much to do while exploring and I can't wait to do it all.